Passamezzo Moderno's New CD Has Arrived! Sample tracks 1-3 by clicking on the mp3s on the right. Go to the CD page to order. Or get a FREE CD for your donation of $25 to Passamezzo Moderno through our affiliate status with SFEMS! "Passamezzo Moderno demonstrated seamless playing and perfect harmony throughout their 17th-century Italian-influence German chamber music...Edwin Huizinga and Adriane Post confirmed they are two of North America's brightest and best young Baroque violinists." Passamezzo Moderno, founded in 2005, is a period ensemble that performs the music of three centuries, from 1530 to 1830, and specializes in the virtuoso instrumental music of the 17th century. Its members are David Granger, dulcian and bassoon, Jonathan Davis, harpsichord and organ, and Edwin Huizinga and Adriane Post, violins. 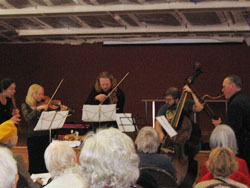 Passamezzo Moderno has performed for the San Francisco Early Music Society, Berkeley Chamber Performances, the Universities of California in Berkeley and Davis, California State University, Stanislaus, and numerous chamber music series throughout northern California. Its first CD was released in 2008 to popular acclaim. 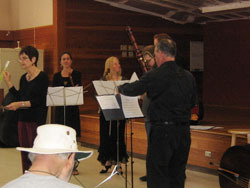 Passamezzo Moderno is an affiliate of San Francisco Early Music Society and a member of Early Music America. 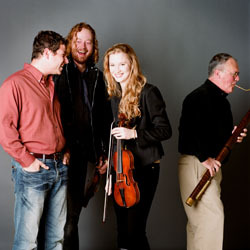 Passamezzo Moderno is an early music ensemble committed to providing their audiences the highest caliber performances on period instruments in historically authentic style. We also are committed to broadening the knowledge and appeal of early music by combining brief lectures within the concerts and through educational outreach. 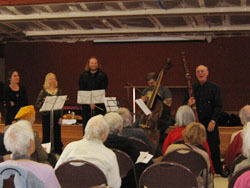 Passamezzo Moderno performing an informal outreach concert at the Berkeley (CA) Senior Center on March 22, 2010.